You may have noticed that use of nettles in culinary dishes are gaining popularity. Some Melbourne restaurants have included nettles and there were bunches for sale at the Queen Victoria Market a couple of weeks ago (Il Fruttivendolo – Gus and Carmel’s stall). Gus and Carmel have not been able to procure any nettles for the last couple of weeks so maybe demand by restaurants has increased. Nettles (ortiche in Italian) are part of the assortment of wild greens – considered unwanted weeds by many and appreciated edible plants by others. Wild greens in Italian are referred to as piante selvatiche (wild plants) or a term that I find very amusing: erbe spontanee (spontaneous herbs). Nettles are high in nutrients such iron, magnesium and nitrogen and can be eaten in many recipes – I ate them not so very long ago incorporated in the gnocchi dough in a trattoria in Cividale del Fruili, a lovely little town in the Province of Udine, part of the Friuli-Venezia Giulia region of northern Italy. Once back in Melbourne a couple of weeks ago I enjoyed them on several occasions as a sauce for gnocchi at Osteria Ilaria and at Tipo 00 nettles have been part of a risotto since it opened– both excellent eateries are owned by the same team. Matt Wilkinson, of Brunswick’s Pope Joan has also been a fan of nettles for a long time. Nettles are easily found anywhere where weeds can grow. If you have ever touched nettles you would know that they sting, cause redness and itching so use rubber gloves when you harvest them. Nettles need to be cooked before eating and because they reduce significantly when cooked, you will need a large amount of them. Remove the stems and choose the best leaves – the tender young leaves from the tips are best; wash and drain them as you do with any other green vegetable. Blanch a few handfuls of the leaves in a pot of boiling water for minute or so – this softens them and removes the sting and you will end up with a dark green soft mass which you may choose to puree even further to gain a smooth, soft paste. Drain and use them – once cooled they can be included in a gnocchi or pasta dough or in a sauce to dress the pasta or gnocchi. Incorporate them as part a soup – great with cannellini or chickpeas. Mix them with eggs and a little grated cheese to make a frittata. For a risotto either use the already softened nettles or sauté the leaves with whatever ingredients you are using for the risotto and then add the rice and broth. On my recent travels to Northern Italy I ate gnocchi with nettles in a trattoria in Cividale dei Fruili. The cheese used to top the gnocchi is smoked ricotta. You will find many recipes for making potato gnocchi and I generally use about 500 grams of boiled potatoes, 150 grams of softened/ blanched cold nettles, 1 egg, 150 grams of flour. You could also try gnocchi made with bread. Equal amounts of nettles and bread, i.e. N.B. Spinach instead of nettles can be used in the recipe. Dampen the bread with some milk and squeeze any moisture from out before using. Mix the cooled nettles with the bread in a large mixing bowl. Season with salt, pepper and nutmeg, add the egg and knead well. Add the flour gradually and make small balls with the dough. Flatten them slightly with a fork. Boil in salted water until they float to the top. A simple sauce can be some lightly browned melted butter with sage leaves and a good sprinkling of parmesan cheese. 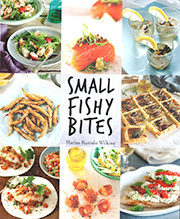 In my book, Sicilian Seafood Cooking I have written about wild greens in Sicily. Use the search button to find recipes for other foraged vegetables, i.e. Wild Fennel, Chicory, Wild Asparagus, Malabar spinach, Purslane, Mushrooms. Sea urchins and they are now available (July) at the Queen Victoria Market at George The Fish Monger. They are called ricci in Italy (di mare means from the sea) and are considered a culinary delicacy – the two most common ways to eat them are very fresh and raw with a squeeze of lemon juice (like oysters) or in a dressing for pasta. The roe (the edible part) is never cooked directly – it is much too delicate in flavor and consistency. In the pasta dish it is the hot, cooked pasta that warms (and ‘cooks’) the roe – flip and toss the roe over and over until all of the ingredients of the pasta sauce are evenly distributed. I have written a previous post about sea urchins and a recipe for preparing spaghetti SPAGHETTI CHI RICCI – SPAGHETTI CON RICCI DI MARE (Spaghetti with sea urchins). 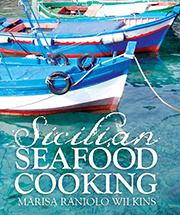 This recipe is also in my book Sicilian Seafood Cooking. In Australia we have different types of tuna: Albacore, Bigeye, Southern Bluefin and Yellowfin tunas. Bonito and mackerel as well as tuna are part of the same family (Scombridae). Albacore tuna is sustainable, cheap in price and much under-rated in Australia. It is not sashimi grade so the Asian export market does not want it and I think that this is the reason why in Australia we tend to undervalue it. It is denser in texture but excellent for braising (lightly or cooked for longer). Generally it is sold as a wheel but I have also been able to buy it as a fillet – perfect for baking and braising in one piece. When I see Albacore tuna I grab it. It is caught in winter on the coast of Southern New South Wales but unfortunately not many fish vendors stock it. This is Mike holding one of the Albacore tuna at his stall in the Queen Victoria Market. He looks very noble in this photo. In this recipe the tuna is lightly braised and has slivers of garlic and mint studded throughout the pieces of fish. 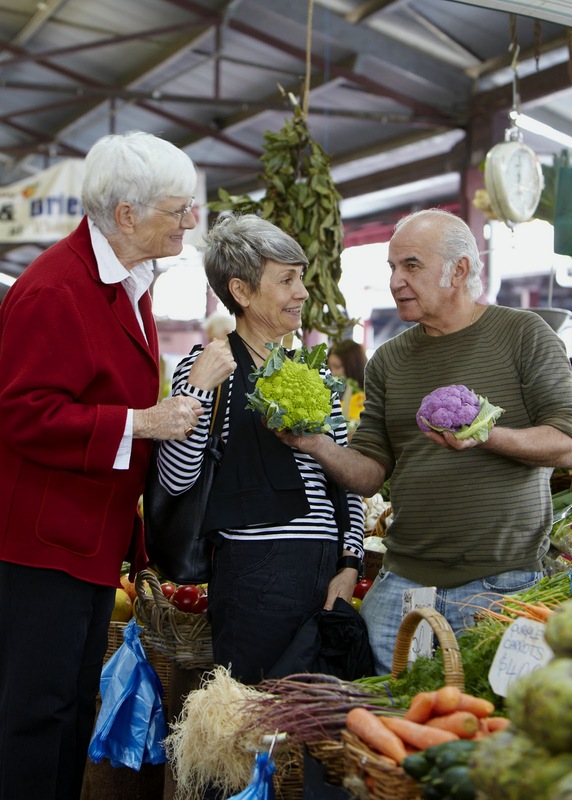 The rest of the ingredients and cooking style are Sicilian through and through. I prefer to use a large round piece of Albacore tuna for this dish, which can be separated into 4 portions. Cut the 4 portions of tuna from the round piece. Discard the skin around the outside. Use a thin, sharp knife with a long blade and make 2-3 deep, regularly spaced slits into each hunk of fish (I made 3-4 slits in the biggest pieces of fish). Insert into each split half a clove of garlic and in another a mint leaf. Heat the extra virgin olive oil in a pan large enough to accommodate the fish in one layer. Sauté the fish, turn once (until it colours), remove and set aside. Sauté the onion in the same pan until it becomes golden and soft. Add the anchovies and stir them around over moderate heat – they will dissolve. Add olives and the seasoning. Add the orange slices (optional). Add the sugar, watch it melt (still over medium heat) then add the vinegar and evaporate it. Return the tuna to the pan it and cook gently until it is cooked to your liking – this will depend on the size of your fish and how you prefer to eat it. For my tastes I return the tuna to the sauce mainly to reheat it as I do enjoy my tuna fairly underdone (this is in comparison to how Italians generally eat tuna). I have also cooked the slice of tuna whole. I bought this fish at the Queen Victoria Market. What motivated me to buy it was the sustainable label. My fish vendor does not usually label his fish as sustainable and I was quite impressed. In fact I shook his hand. I chose to ignore the fact that it comes from New Zealand – flown in daily the vendor said. Unfortunately it is not exactly local. It was $32.00 per kilo. It weighed one kilo. He always asks me if I want whole fish filleted. I always say no. ‘Best steamed’ he said. So I chose to bake it in baking paper – in cartoccio – it keeps in the moisture. I wanted to taste the fish not drown it in flavours so I chose simple flavours: caper berries, slivers of garlic and some parsley and fresh rosemary and bay leaves to stuff the cavity of the fish. You will notice that the fish is greenish-blue to blue-black in colouring. It is a white fish with medium texture and the flesh remained very moist.The Blue Cod are caught sustainably because potting is used – The pots are baited and once the fish is inside they are trapped. Each pot is set at a size that allows younger undersized fish to escape and any by-catch is released unharmed. If I want sustainable fish I have to be prepared to pay for it and you can see why the price is high. Either use 2 sheets of baking paper or use one sheet of baking paper on top of some metal foil. The two layers will help prevent the paper from breaking when you put it in a serving dish. Make sure the cavity of the fish is very well cleaned and stuff it with the rosemary and bay. Place 2 large sheets of baking paper on a baking tray, sprinkle it with salt, pepper and a drizzle of extra virgin olive oil. Sprinkle a little parsley some garlic slivers and some capers on the paper and place the fish on top. Repeat what you did on the bottom of the fish on top of the fish. Wrap the fish completely in the paper and place it in a baking pan, then bake in the oven for 25- 30 minutes. (I prefer my fish not to be overcooked). Remove the pan from oven and leave the fish wrapped up in the paper for an extra 10 minutes. Take it out of the paper and keep the juices as the sauce. Drizzle a little extra olive oil on top and some more freshly ground black pepper – I cannot help being Italian!